It’s that time of year again. Time to dust off those favorite holiday recipes—the ones you only make once a year. Maybe it’s Grandma Ferguson’s sticky buns or Great Aunt Ethel’s sugar cookies. But maybe you’re the type to seek out a new recipe every year. I fall somewhere in the middle. I have some personal family favorites passed down through generations but I’m always looking for new recipes. 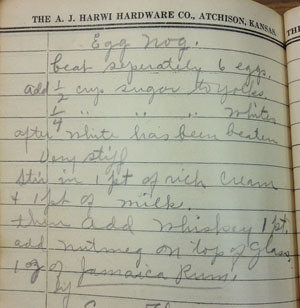 As luck would have it, I recently came across an eggnog recipe in History Colorado’s collection (Photo: Eva Dennis's cookbook, R.25.2009). Typically, the eggnog recipes I choose are some sort of lightened version. This historic recipe is not. So I decided to test the full fat recipe, and guess what? It was totally worth it. Before I provide details about the recipe, I thought you might like to know more about the recipe’s original owner. Eva Dennis was the cook at the Thatcher Ranch in Pueblo County sometime between 1920 and 1930. She kept some of her favorite comfort food recipes in her “Want Book” (grocery list), a hardware store give-away. Separate the yolks and egg whites of 6 eggs. Beat yolks until thickened and lightened in color. With beaters on add ½ cup sugar and beat until sugar dissolves. My change in the recipe: In a medium saucepan, over high heat, combine the milk, heavy cream and bring just to a boil, stirring occasionally. 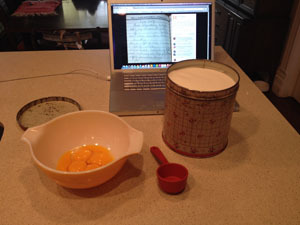 Remove from the heat and SLOWLY add (whisking continuously) the hot mixture into the egg yolk and sugar mixture. Then return everything to the pot and cook, whisking continuously, until the mixture reaches 160 degrees F or slightly bubbles around the edges. Remove from the heat, stir in the whiskey, pour into a medium mixing bowl, and set in the refrigerator to chill. Beat egg whites until soft peaks form. 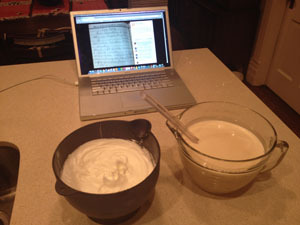 With beaters on add ¼ cup sugar and beat until stiff peaks form. Whisk egg white mixture into chilled egg yolk mixture. Add nutmeg to the top of each filled glass. All my test kitchen subjects approved of the recipe highly. Comments ranged from, “Wow, that’s really good,” to “It tastes like Baileys.” For myself, I think it was strong but delicious. Next time, I would only add 1 cup of whiskey but increase the rum to 2 ounces. I recommend drinking it within a day, as the egg whites naturally fall and you lose some of the thickness of the eggnog. Regardless of how I tweak this recipe, Eva sure made some ranch hands happy with it. I plan on making it again when my family gets together for the holidays. And whether or not it becomes a tradition, I’m thankful that Eva wrote it down. It certainly has survived the test of time.